Filo is easy to work with and not that hard to make! But if you want to buy some, go for Greek of Turkish if you can. Failing that, there are standard varieties available. You may have noticed there’s more than one type. Experiment with them all and you will find what suits you best and for which type of filling. Also whether you roll or stack. For this pita, because the filling is heavy, I have gone with a packet of eight large sheets, using two sheets per roll of filling, bending each roll in a circular fashion around the tevsija. Half an onion, 1 courgette, half a squash, half a red pepper, half a carrot, 1 celery stick – all chopped. You could add feta if you like. Put the filling ingredients on a pan on the stove top with a lid on, low heat, until the veg have softened. Let the filling cool a little then spoon along two sheets on top of each other then roll over, repeat until all sheets are used. Put olive oil in the oven dish and lay the rolls on top. Place parchment paper on top and bake slowly for 45 mins to 1 hour. Serve with Mexican bean salad! Lazy rolls of thunder, sheets of silver and pounding water on sills late at night finally burst the brief heat bubble. Everyone was out. The bus which goes every ten minutes between two old wool towns was full, stopping at every sign, we eventually reached our destination. The difference between the two towns and their approach to regeneration is apparent. One is achieving the other is flailing. How so, when they share a common history, heritage. What does it say about visionaries in town planning and investment. Both have relied heavily on grants, with some mill owners investing in their own properties to enhance new uses of vast mills, both towns have such places. But vision isn’t about money, it’s about love. I can’t help but compare to cities of Italy. Small is beautiful. The artisan is appreciated, local produce desired, and from such visions of love have come a world-wide reputation. Today I did a little experiment with layering. The usual way to make filling for a pita or gibanica is to place all ingredients in a bowl and mix. This time I layered with out mixing. Two sheets of filo for the base, the fresh spinach leaves followed by cracking eggs directly on top, then grating the courgette. Finally a layer of filo. The result was an enticing picture of colours and flavours, brought to life. Like winter in to spring. Am loving greens and yellows right now. There is no set recipe for this dish, it’s all down to how you like it. Firstly let me explain something about gibanica (gib-an-it-sa). It isn’t eaten as a main course or a starter. 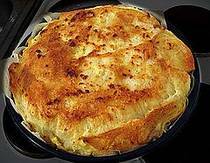 It’s rarely eaten with anything else, although it seems some like it with a bit of sour cream. It’s normally served all by itself, either straight after the main course at a slava or other big sit-down meal; or just with a coffee, followed by a piece of walnut torte or figs and yoghurt. I didn’t like it as a child – or rather it didn’t like me -eggs and cheese didn’t agree with me. I make it now and then, when the mood takes me. And each one is different. 1 large round enamel tevsija. You don’t have one? Then any good-size oven dish will do – a deep one. 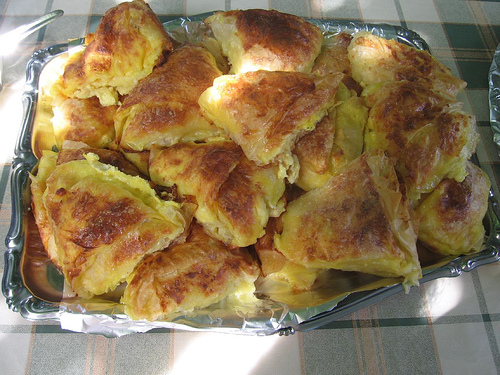 1 packet of fresh Greek or Turkish filo pastry – but you will only need to use half the sheets. Alternately make your own filo! Just a good plain flour, warm water and olive oil – plus patience and working by the feel of the dough. I used to make it with my mother and stretch it over the dining table. Pre-heat the oven to pretty hot. Whisk them and add a little salt. Now gently break up the butter and cream cheese in the mixture,whilst stirring round the crumbly cheese and milk. What you should have is a lumpy mixture, not too runny. Taste it, it should be slightly salty. Oil the base of your oven dish and take two sheets of filo. Place them in the bottom all scrunched up like a range of mountains with peaks. Ladle over some of the mixture. Put on the next two sheets in the same manner and repeat the ladling. Eight sheets are usually enough. The last two go on top -all the mixture should underneath them. Take a sheet of greaseproof paper and place on top. Sometimes I line the dish with paper as well. Pop the gibanica in the oven for 30 minutes. It should rise. Take away the paper for the last 10 minutes to let it brown. The gibanica is normally done after 40 minutes -give it another five if you are not convinced. I like my gibanica warm, some prefer it straight out of the oven, others stone-cold. Keep it in the fridge and it will last up to three days. How much should you eat in one sitting? My advice is be sensible -it’s very filling even if you use all low-fat, skimmed-milk ingredients. I’m happy to have a piece for lunch followed by some fruit. A slice at breakfast? Yes, very decadent! It’s a great dish for guests when you’re not in a cake mood and you are savoury (like me) rather than sweet. Enjoy.